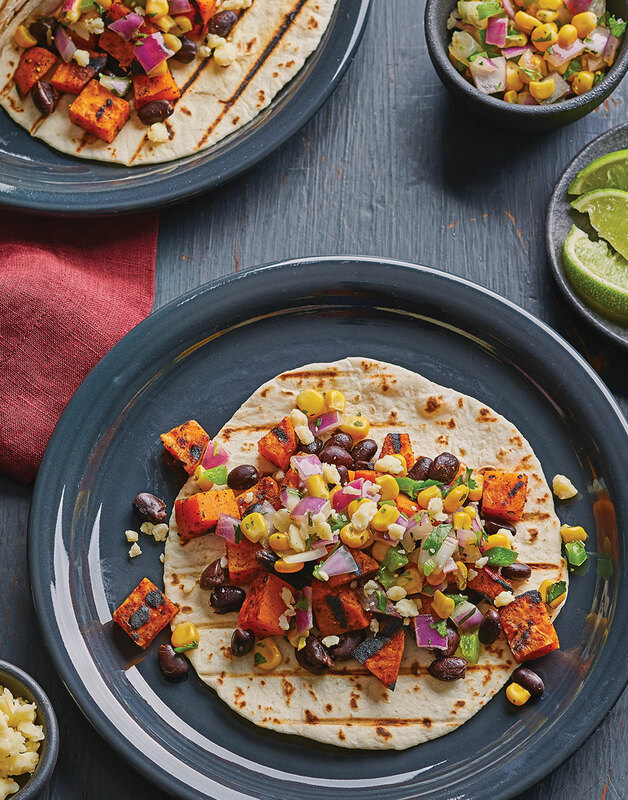 Bursting with color, flavor, and textures, these sweet potato tacos have got it going on. Plus, with black beans and the veggie-centric ingredient list, these babies are nutrient-rich. Toss potatoes with 3 Tbsp. oil. Combine chili powder, garlic powder, salt, paprika, and pepper; toss with potatoes. Toss onion and jalapeño with remaining 1 Tbsp. oil; season with salt and pepper. Grill potatoes, onion, and jalapeño, covered, until charred and tender, 4–5 minutes per side for sweet potatoes, and 2–3 minutes per side for onion and jalapeño. Grill tortillas until grill marks appear, about 1 minute. Cut sweet potatoes into bite-sized pieces, toss with black beans and 1 Tbsp. lime juice, and season with salt and pepper. Dice onion and mince jalapeño, then toss with corn, cilantro, and remaining 2 Tbsp. lime juice for the pico; season with salt and pepper. Divide sweet potato filling among tortillas and top with corn pico and Cotija. Serve tacos with lime wedges. For ease of grilling and flipping, cut the onion thick enough so you can skewer the slices. You just want to warm the tortillas so they’re pliable. When you see grill marks, they should be ready.